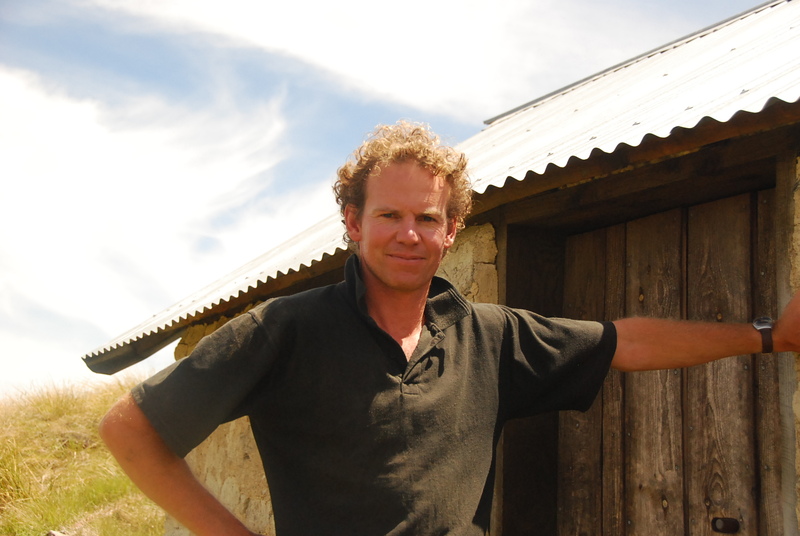 Tom O’Brien, owner of Blackmore Farm and founder of High Country Walks has followed his passion by offering up a little hut on the back side of his 5000 acre farm. Called the Chinaman’s Hut, it was restored some years ago, by local volunteers, Tom and his father. The hut is situated on the rolling mountains of the Slate Range, just south of the Remarkables Mountains, on the border of Otago and Southland. Tom took the afternoon to show me his farm, the backcountry and the Chinaman’s Hut. below is a short piece on the hut, and a chat with Tom about his philosophy and passion of sharing this part of the world with others.We’re in hopes, here at Mountain Spirit Institute of collaborating with Tom by running some programs on the Slate Range and Blackmore Farm. We chatted about providing Solo’s and other types of programs. Thanks for the time you took to show me around Tom! Note: I’ve met one of the volunteers who helped restore the Chinaman’s Hut, a neighbor of ours here in Kingston named Dusty, who I’ll see if I can get on tape in the next few days. He has an interesting story to tell of not only this restoration project by many others. Nothing to see here, keep moving..
Milford Sound is renowned for its world class beauty, its fjords, hikes, and waterfalls, wildlife and dramatic alpine terrain. It’s something to put on your “must do” list, despite its popularity with so many that come to New Zealand. 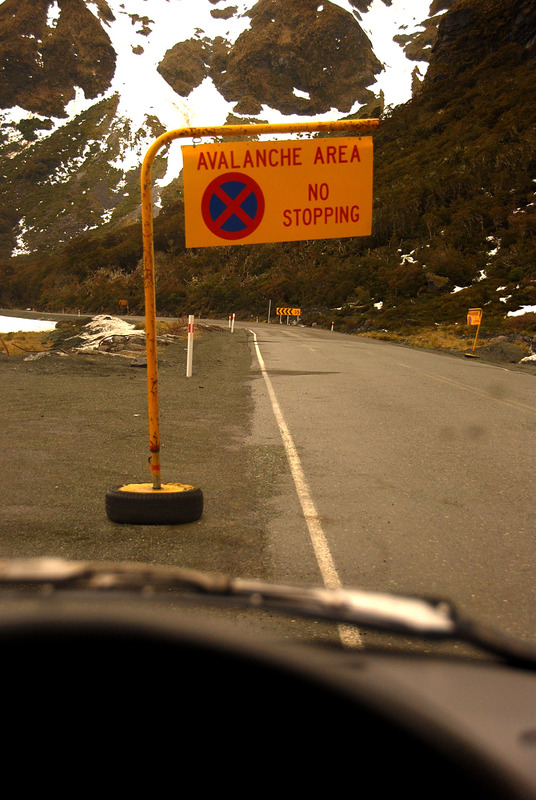 However, the drive through (and under) the mountains, on NZ Highway 97 and its the 1270 meter Homer Tunnel also got my attention. I’m looking forward to getting out into the Darran Mountains soon, where there’s granite and lots alpine adventure to be had. We took a day off, and drove over to Milford last month, and thought we’d share a few images. Heading back to Kingston, we caught a glimpse of the wind farm, which is somewhat controversial in this area, and stopped to take an image of the huge blades above the fields of sheep. Yep, we did get out of the car, these are just some images taken along the road. 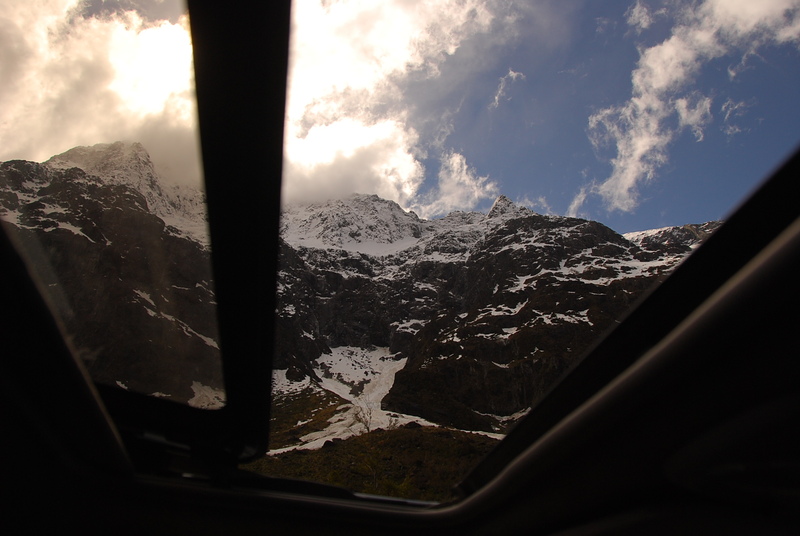 More on the backcountry and Milford Sound in another post. Says one movie critic about the movie Outsourced, “It does for cultural differences with humor, what ‘Crash’ did with intensity and violence.” I found it to be a wonderful treatise on the Ugly American turned good. Using the metaphor of outsourcing, Yankees are forced, through humor, to reassess the American way of life. According to United States Government Accountability Office, about 28 percent of the U.S. population has a passport, and the main character in Outsourced is no different. 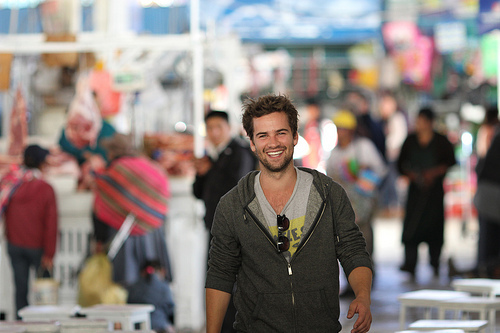 But he eventually awakens with his first trip to India to learn not only about a rich country, but about himself. See this movie. Outsourced is a modern day comedy of cross-cultural conflict and romance. Todd Anderson (Josh Hamilton) spends his days managing a customer call center in Seattle until his job, along with those of the entire office, are outsourced to India. Adding insult to injury, Todd must travel to India to train his new replacement. As he navigates through the chaos of Bombay and an office paralyzed by constant cultural misunderstandings, Todd yearns to return to the comforts of home. But it is through his team of quirky yet likable Indian call center workers, including his friendly and motivated replacement, Puro (Asif Basra), and the charming, opinionated Asha (Ayesha Dharker), that Todd realizes that he too has a lot to learn – not only about India and America, but about himself. He soon discovers that being outsourced may be the best thing that ever happened to him. 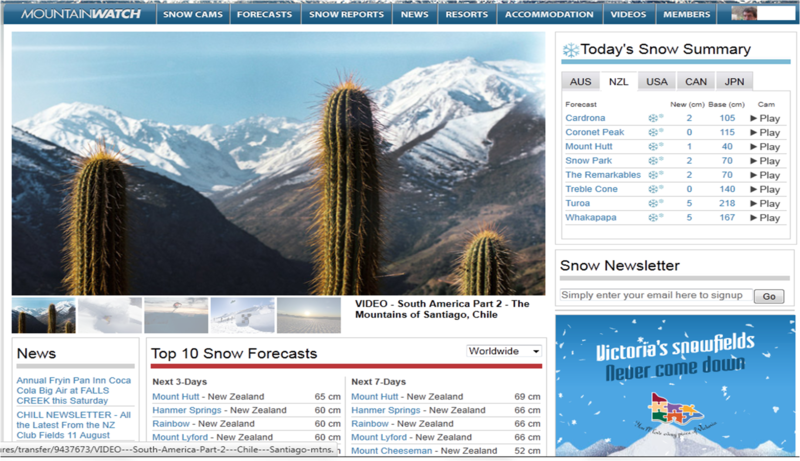 While it’s a bit too focused on the frontcountry scene, the worldwide reports and list of snowcams can’t be beat. Check out MountainWatch.com for snow conditions, news and forecasts. 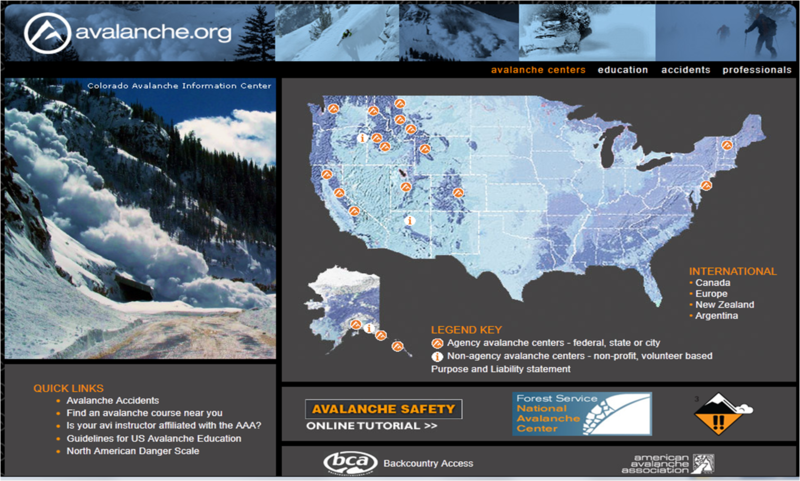 Avalanche.org is what your really want to get access to local avi conditions worldwide. With a click, you can jump from North America to New Zealand and zero in on your region before you head out. On a completely different note, I just stumbled upon what appears like a good site for transferring money. MoneyGram only works if you’re in the U.S and God bless Western Union for being around longer than Greyhound, but their online system has never worked for me, and by god, they’re expensive. 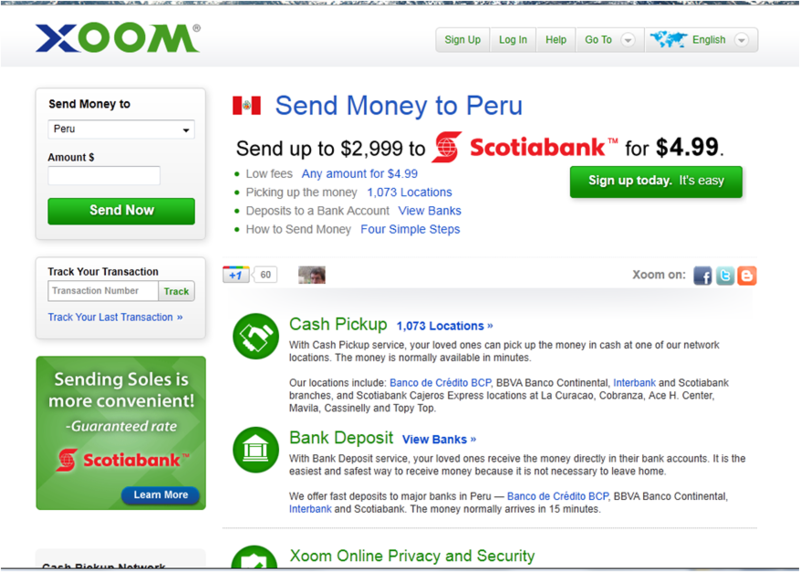 So check out Xoom.com, it’s who I’ll be using the next time I need to send some funds across the ocean blue. Peru’s Ministry of Tourism and Foreign Trade said Tuesday that a recent study supports more than doubling the number of visitors to Machu Picchu, the ancient Inca citadel perched on a mountain top in Cusco region. 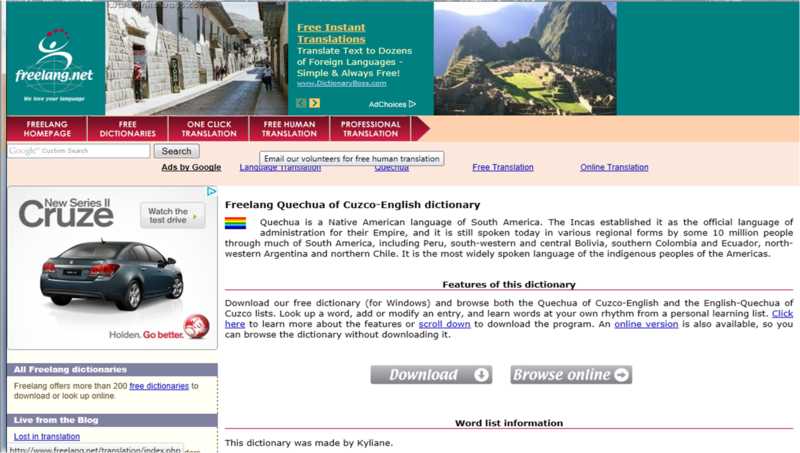 Currently, the daily limit on tourists that can enter the Machu Picchu site is set at 2,200. According to state news agency Andina, the ministry’s study suggests the citadel can withstand 5,479 visitors a day. 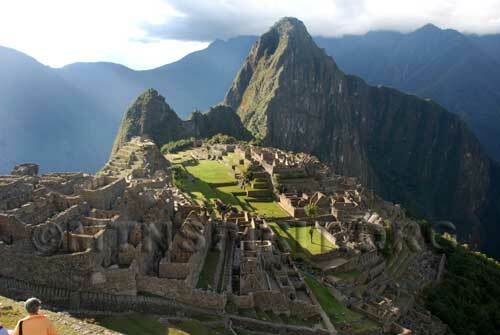 This would allow Machu Picchu, a World Heritage Site, to receive approximately 2 million tourists a year. The study is in direct contrast to the opinion of UNESCO, read the rest of this story.. Fellow MSI board member Bob Stremba and I recently decided to spend a couple of days on New Zealand’s Routeburn walk, one of the famous tracks in the Southern Alps. We did it last week, during the shoulder season so there were only a handful of people on the trail. But I can imagine the numbers grow exorbitantly during the summer months. Fair enough, that’s how New Zealand has decided to funnel foreign hikers, and showcase tourism into a few of the well-known tramps. Milford Sound not far away is another. The irony of first class and coach system arriving in the mountains struck me immediately with the thought that there should be a sign on the DOC hut stating, “Strictly Independent Walkers, Guided hikers should continue on to the nearest Hilton”. Of course I don’t really feel that way, but it was the first thing that came to mind. Better yet, maybe the cognoscenti should overthrow the highfalutin hut and invite the coach class to join them, (and possibly even have a food fight). The only site I can remotely remember seeing like this was in the Alps. Of course high living gentiles are still staying in the hotels just below the faces of the Matterhorn and Eiger. The only class arrangement I can remember seeing was in the Alpine Club huts of the Alps where the mountain quide’s quarters, were separated from us chattel climbers. But this, here in New Zealand was a whole other matter. I’m sure Oliver James, author of Affluenza would be proud of most Kiwis who shun this sort of thing in their mountains. I then found my tolerance level further tested with another sign telling “independent hikers” to a) turn around, b) march their little butts down to where they belong c) and stay there, all with the Orwellian salutation of “Hi There!” See the actual text in the image above. I hope that “haute couture” in the backcountry stops with this hut. I’m assuming there may be others though. Even though this super-duper hut sits in the heart of the Routeburn, in the real backcountry, we’re still all the same. The problem is, having such a lodge like this goes a long way in destroying the very experience the concession is trying to offer. By its very nature, it removes itself from the backcountry. It brings the virulent virus – the epidemic of affluenza to the doorstep of paradise. Tell us what you think about allowing such multiple uses on government land such as luxury lodges (such as this one run by Ultimate Hikes) Is it a bad idea? 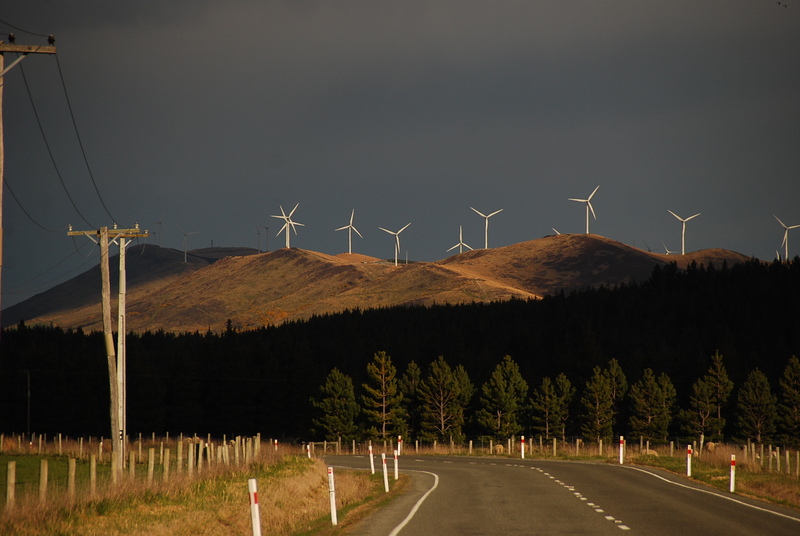 Are we missing something about the land use plans of NZ? If you’re thinking of taking a guided hike, suggest to your guide that he put you up with the rest of us. You’ll find it much more inspiring. Also suggest that they could change their signs to a less snooty sort. Bill and I just returned yesterday from an amazing trip to Ecuador (Galapagos Islands) and Peru (Lima, Cuzco, Machu Pichu). 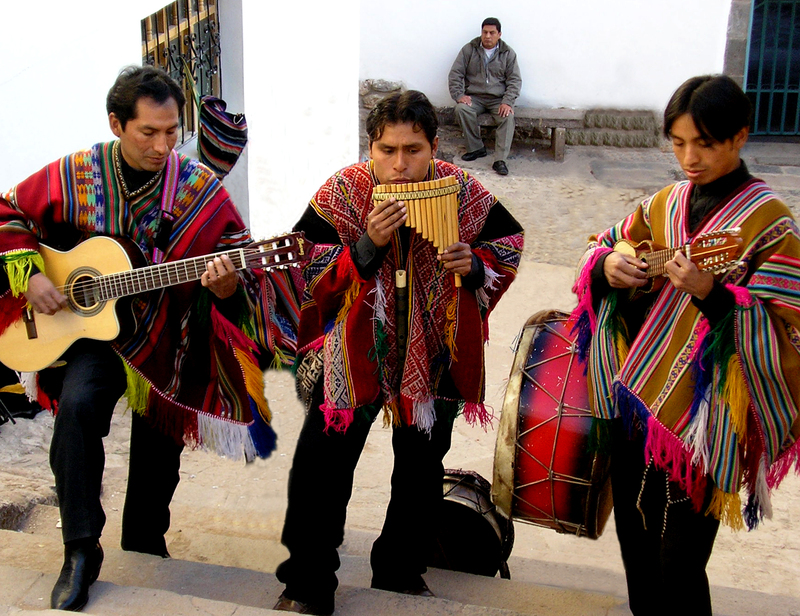 Our tour group was treated to a performance by Chimu Inka at a local restaurant in Cuzco for our farewell lunch…we thoroughly enjoyed their music. I purchased their CD but didn’t open it until we were back at our hotel. Little did I know I’d see Sunapee, NH on the inside cover…the name Dexter didn’t ring a bell, but I suspected it was you as I recalled your last name. Sure enough, I called Carol and she confirmed it. Wish I’d opened the case while at the restaurant. Our tour guide was an amazing guy, born and raised in Cuzco, G. Walter Rodriguez, in case you might know him. They had a group of 4 dancers performing with them…I was privileged to be pulled into the dance with one of the guys…it wasn’t easy at that altitude! But what a great memory! It was exciting to have that connection and a great memory of our trip. Kiwis and Aussies Travel Footloose Around the Globe, Right? Young Americans on their trip abroad, usually see, in amazement, the Aussies and Kiwis on their “OE” or Overseas Expedition, as they tick off another year, another country. It’s so different than the Yankee program, where we might take a semester abroad or a summer backpacking and Eurail trip through Europe. The Australians and Kiwis really have it good. “How do that do that?” we ask ourselves. The article below by Anna Hart gives a perceptive glimpse into the mindset of the Kiwis and how they value an overseas expedition. This story might surprise you as it did me.